Number five from 30 Things. What are 5 things that make you the most happy right now? 1. My little monkeys. I know, shocking. I don't talk about my kids that much. (ha!) But I love their little faces so much. Hearing their voices in the morning when everyone wakes up makes me happy. Especially when they start laughing with each other. Then we hear, "daaaaaddy, moooommmmmy!" It makes it easier to get my non-morning self out of bed. 2. An ice cream cone around 8:15 pm. As much joy as the chilluns bestow upon me, bedtime also makes me quite happy. 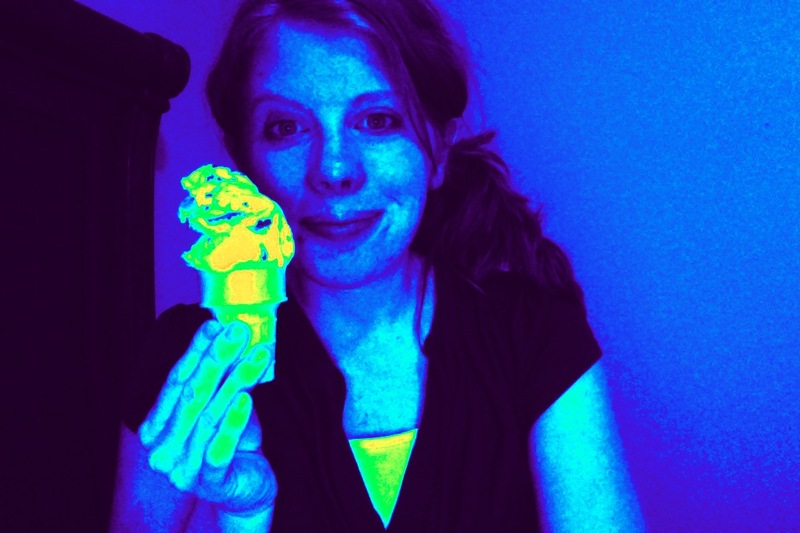 Every now and then (not every night, I promise) I stack a plain cone full of delicious ice cream. It makes me very happy indeed. I'm not sure this baby will share my affinity for sweets. I haven't been able to eat as many treats during this pregnancy that I normally do, pregnant or not. Too much sugar makes me sick. Since I'm not running, maybe the baby is saving itself from it's sweet treat lovin' mother. You don't get a normal picture. 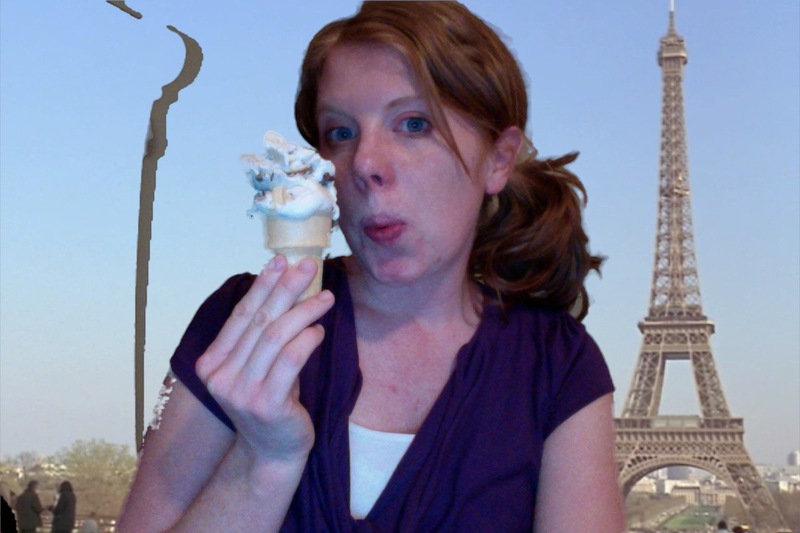 Blame Photo Booth and it's many options. 3. Good TV. I was recently introduced, recommended, goaded upon to watch Downton Abbey. So I signed up for Netflix and their free month trial. Not only was it great writing and character development, it also plays right into my fantasy of living in an age and lifestyle of courting, dressing up for dinner and bringing along a parasol during a Sunday stroll. I watched the first season in 3 days. I'm not just going to let a free month of Netflix pass me by! So, totally different end of the spectrum, I decided to watch Battlestar Galactica. Not the original 70's version, the Edward James Olmos version. Yup. It's good. So knowing I have a fresh episode waiting when I get the hankering after the kidlets are down, it makes me happy. 4. Prayer. It's seems out of place to put such a spiritual bite of happiness amidst such secular joys, but it's a really important part of my life. When I don't do it, I feel lost and out of sorts. But when I take the time to offer a sincere prayer, I am happy. As a selfish human, I usually have a laundry list for God of what I need and want help with. But usually, my heart is most content and happy when I start to list and thank God for everything I have, the people in my life, my freedoms, my blessings, my gifts, my family, my husband, the weather, and so on.... I have a lot. Remembering and thanking God for my blessings makes me happy. 5. The weekend. This is another surprise, I know. The fact that tomorrow is Thursday, one more day closer to Friday afternoon... Oh man! My heart just lept a little thinking about it. There is something so special about our two days together as a family. I feel immediately relieved and refreshed from the added support and help. I love to go to church on Sundays and refill my empty cup. Saturdays we play together and try to do fun things. Or I get a free pass to go and do something by myself. About a month ago, the kids were taking their morning nap, and Chris suggested I take the paper and go to lunch. Whaaaaa? So I did. I had a big Cafe Rio salad and read the paper. You would've thought someone gave me a trip to Paris. Another Saturday, I woke up for an early morning pregnant potty break. It was around 5:30, so there was a faint amount of light outside. It was also cold and rainy. For whatever reason, I decided it was a donuts for breakfast type of morning. But I just thought it, then fell back asleep. I wake up 2 hours later to Chris getting dressed. Where are you going, I ask. He tells me he thought it would be fun to run and get donuts for the kids for breakfast. (He also meant me, but he's a gentleman and would never say he was running to get his wife donuts for breakfast.) So yeah, I really like the weekends. They make me happy. Speaking of happiness, I will leave you with this happy song. If this doesn't put a smile on your face...well, it will. Trust me. "Do you want to sing?" Ha ha ha ha.. Girl after my own heart, there!